The intense, brooding and emotional sound scape of CALLA is a product of the diverse environments in which it is forged. No record reflects this more than 'Strength in Numbers', the band's second album on BEGGARS BANQUET after the critically acclaimed 2005 album, 'Collisions'. 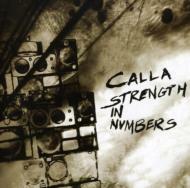 While 'Collisions' was driven out of the Calla's raw live sound, Aurelio Valle (vocals, guitar), Wayne Magruder (drums) and Peter Gannon (bass guitar) had more ambitious goals for 'Strength in Numbers'. The album combines all aspects of their past work: The experimental, the live and distorted, the odd and the beautiful. From their home in Brooklyn, to their roots in Texas, 'Strength in Numbers' represents the amalgamation of a band's experiences.